San Holo is the future beats to trap connoisseur that has been dubbed the fastest growing talent in electronic music - a title that seems all the more fitting with every new release. Debuting in late 2014 with the COSMOS EP on Heroic, he quickly garnered the attention of major tastemakers and curators alike. This resulted in a friendship with the Parisian Point Point crew, who released his ‘Hiding (ft. The Nicholas)’ single on their Filet Mignon compilation. 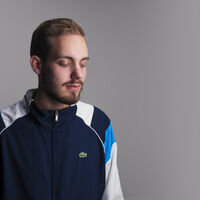 The world quickly took notice as San Holo grew to over 250.000 SoundCloud followers. His single ‘We Rise’ came out on NestHQ (OWSLA) garnering Skrillex and Diplo’s support and amassing millions of plays on SoundCloud and Spotify. In early 2015, the Victory EP came out on the Canadian label Monstercat, renowned for having one of the most engaged and digitally oriented audiences. The release was paired with an intense visual campaign produced by San’s own creative company and label bitbird. Together with an official remix for Tchami’s hit ‘After Life’, an Initiation Mix on BBC Radio One with Annie Nightingale, and a performance at Tomorrowland, San Holo transitioned from a big SoundCloud name to becoming a real force within the music industry. Meanwhile the ‘Don’t Touch The Classics’ series was born, where San remixes classic 90’s and early 20’s hip-hop tracks, with the ‘Dr. Dre – The Next Episode’ remix crossing the 85 million plays mark on YouTube. From there, a series of innovative music videos were launched, with the release of IMISSU (Spinnin’), being accompanied by a ‘100% screen capture’ music video in which the struggles of an electronic music producer are portrayed. The video for the next single, Can’t Forget You (Spinnin’), portrayed the life of a fan-vlogger desperate to validate her love. 2016 will be all about establishing his name as house-hold name in the scene. The year was kickstarted with the release of ‘Alright’, a collaboration with Yellow Claw on OWSLA’s Worldwide Broadcast compilation, and an official remix for Yellow Claw & DJ Mustard’s single ‘In My Room’. His New Sky EP also just came out on Monstercat, featuring an intense video about the loss of a loved one for ‘They Just Haven’t Seen It’. San recently just completed his New Sky Tour, a 27 date two month long tour through the first quarter of 2016 across North America highlighting plays at Ultra Music Festival and Coachella’s Do Lab. San Holo also founded bitbird, a creative company and record label, together with his team, as a platform for showcasing and developing inspiring art.